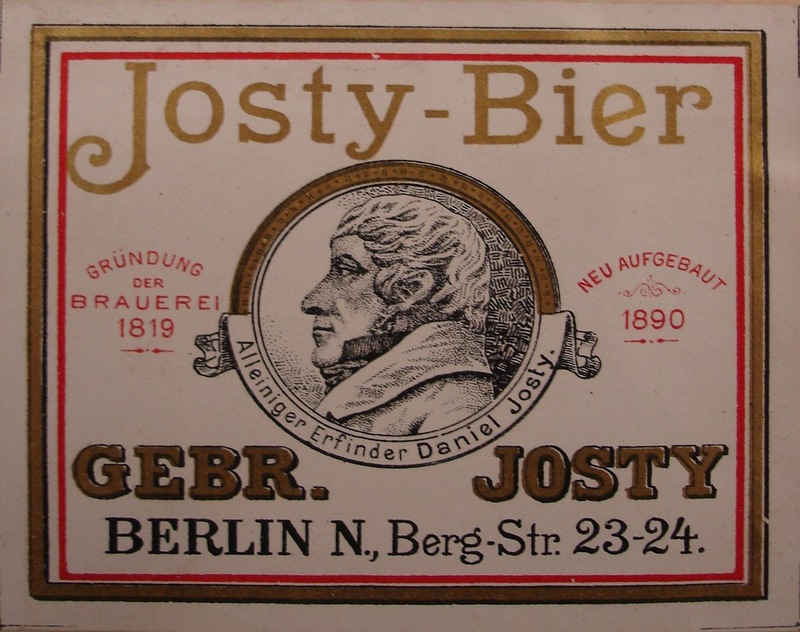 Some time ago both Ron and I came across references to “Josty’sches Bier” in analyses of old German beers. As I didn’t know what it referred to, I spent a spare evening compiling everything that Google has to say about Josty’sches Bier. The first thing that can be said with some certainty is that Josty beer was the product of a particular brewery, and not a type of beer for itself – at least, not a type made by several competing producers. Josty. Berliners associate both a sweet and a bitter taste with this name. A tourist seldom leaves the city without having tried at least one of the two. The Konditorei of Josty & Co., Unter der Stechbahn Nr 1, is equally as famous as the stomach-strengthening bitter beer that Herr Daniel Josty (Firm: Josty Bros., Prenzlauerstrasse Nr. 59) brews and serves in his taproom and restaurant at Markgrafenstrasse Nr. 43. What was the beer like? It’s an interesting one. Ron has an analysis showing it containing just 2.68% alcohol in 1850. Another shows 3.10% in 1864 (The 2.68% figure may be alcohol by weight, which would (I think) result in an alcohol by volume figure close to 3.10%). The contemporary tasting notes I posted some time ago describe it thus: “The beer was light brown, clear, very foamy, with a clean bitter taste, and with the exception of carbonic acid, almost free of any other acid. The Josty’sches beer is a weak-bodied beer. It is top-fermented, contains more hops and less sugar than the Werder beer, in addition to which the colour is lighter, and does not have a burnt taste. Adulteration was not evident.” Baedeker’s guidebook of 1862 calls Josty a “bitter, aromatic beer”. Take all due care, and do not drink the white beer, but the quassia-containing Josty beer, if that is still about. Here [in Frankfurt] I am withdrawn from any beer; Kant hated beer and never drank any. Schopenhauer had left Berlin for Frankfurt in 1831, so we can presume that Josty was producing a quassia beer during the 1820s. Or can we? There may have been quassia beers – no Reinheitsgebot in Berlin at that time – or did Schopenhauer just assume that it contained quassia because it was so bitter? We do know three things: the fad for “medicinal” beverages was as strong in 19th century Berlin as it was in Victorian England; the public health inspectors of the time were concerned with the use of non-hop bittering agents; and as late as 1900 Josty Bros. themselves were advertising “Medicinal and Sanitary Beer”. So it doesn’t seem impossible. One modern article credits Josty with having invented the custom of adding woodruff to Berliner Weisse. I am strongly inclined to treat this as folklore, as I have not encountered any evidence indicating that Josty ever even brewed Berliner Weisse. Then again, it’s given me the idea of trying to find out when people did start putting syrup into it. Josty’s Goldperle. This beer is a light, bright excellent Lagerbeer of pleasant pure taste, and as it contains but little alcohol, it is very wholesome for the stomach. Josty’s Trinkwürze. The so-called Trinkwürze is a lightly fermented Maltbeer, highly nourishing, brewed from wort, free from surrogates, at 18–19 degrees, distinguished by a relatively large proportion of unfermented malt and dextrins. Josty’s Eisenmalz-Extract (Iron malt extract). According to the analysis this is a strong pure Maltbeer, but slightly fermented, containing but little iron. This beer is equal to an original wort of about 17 degrees, and containing much maltose, dextrine and nitrogen, it is of a relatively high nutritive value. Josty’s Porter (pasteurised according to Gronwald’s process) has a very strong taste, contains a plentiful supply of hops and, according to the analysis, is brewed without surrogates and is an excellent substitute for the genuine English Porter. I wonder how the chemist’s observation that the “iron malt extract” didn't actually contain much iron made it into an advert. Possibly the management didn’t check foreign-language copy as carefully as they might have done. Josty’s Rauchbier nach Grätzer Art (brewed according to the Graetz process) is prepared from the best raw materials and is in all respects superior to all similar kinds of beer. The move to Bergstr. does not seem to have been a success, with the brewery continuing only until 1903–1910 before being sold and was already closed by the time the First World War broke out. It was renamed “Bergbrauerei Nacher” after the managing director of the purchaser, the Engelhardt brewery, and produced Caramelmalzbier for the group. Engelhardt was supposedly the largest producer of Caramelmalzbier at the time and is also credited with introducing the returnable deposit bottle. Herr Nacher was Jewish and when Hitler came to power Nacher’s brewery was expropriated and handed over to the Dresdner Bank. The Café Josty continued after the sale of the brewery, its most notable address being on Potsdamer Platz, with Erich Kästner setting part of his Emil and the Detectives there, and Expressionist poet Paul Blodt immortalised it in his “Auf der Terasse des Café Josty”. But the café business was hit hard by the economic crisis and declined in the 1930s. I’ll leave the detailed story of what happened to the café enterprise to cake historians. Lots of questions unanswered still. Why did the Josty family sell up? When did they start brewing Porter and Grätzer, and what did they taste like? As all their other brews were top-fermented, was their Lagerbeer, too? 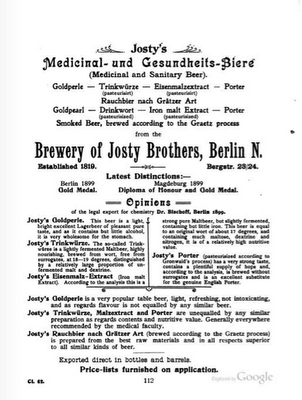 What happened to the original light brown Josty’sches Bier that may or may not have contained quassia and was good for the stomach? Kant hated beer and never drank any. I always thought he was a cant. Gives the lie to Monty Python, though. Seriously, though, fascinating stuff. Are there any sites for viewing scanned 19th century German newspapers, the way, eg, large parts of the British Newspaper Library are now up on the web? You've probably come across this already, but this 1879 book mentions Jostybier alongside other Berlin beers. I hadn’t actually, thanks for the tip. Some interesting stuff in there, notably the claim that there were two producers of Josty beer and another source saying it was herbed. Those beers have lovely names, anyway!